“I’m sure other people in the business have considered reasons why they’re doing what they’re doing, but I do think that if you’re gay you have a responsibility to come out,” she says carefully. Maddow is (again, politely) backtracking today, claiming she never meant that Anderson Cooper should come out. No, no, of course not. Surely we all understood she was referring to that other “equally well-known news presenter who is widely assumed to be gay but has never come out”. Ha! On her Maddow Blog at MSNBC, she confronted the situation head on, albeit in a confusingly hilarious manner. “Regarding The Guardian interview that’s getting a lot of pickup today: in that interview, I wasn’t asked about Anderson Cooper, I didn’t say anything about him, he literally was never discussed during the interview at all – even implicitly. “Although Media-about-media today notwithstanding, I did not in my interview with The Guardian say anything about or to Mr. Cooper, nor would I. Although criticism of Mr. Cooper was intimated by The Guardian and picked up everywhere — I did not make that criticism in the interview, nor did I imply it, nor is it what I believe. We sniff what you’re scratching at, girl, but surely even you can appreciate the irony in you calling out Cooper by name as you pretend to not have outed him. Although, to be fair, he’s about as in as a newborn’s bellybutton that still has 4 inches of rotting umbilical chord hanging from it. 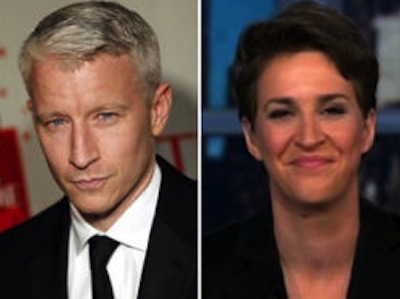 What do you think of this whole Maddow/Cooper she-said-she-didn’t-say-he-said-mum situation?